1.1a Juhani Damski: Customer-oriented services at FMI. 1.1b Laurence Wilson: What Is A Good Forecast: The importance of user-orientation in verification..
1.2 Clive Wilson: Do key performance targets work?. 1.3 Tressa Fowler: Wind forecast verification. 1.4 Robert Maisha: UM model and Kalman Filter forecast verification at SAWS. 2.3 James Brown: The Ensemble Verification System (EVS): A software tool for verifying ensemble forecasts of hydrometeorological and hydrologic variables at point locations. 4.1 Ian Jolliffe: Probability forecasts with observation error: Is the Brier score proper? 4.2 Lovro Kalin: Is ETSS Really Equitable? P10. Marion Mittermaier: Time-series analysis of scale-selective verification: Can we use it for operational forecast monitoring? P18. Ewan J. O'Connor: Cloud verification using radar: What is the half-life of a cloud-fraction forecast? P26. 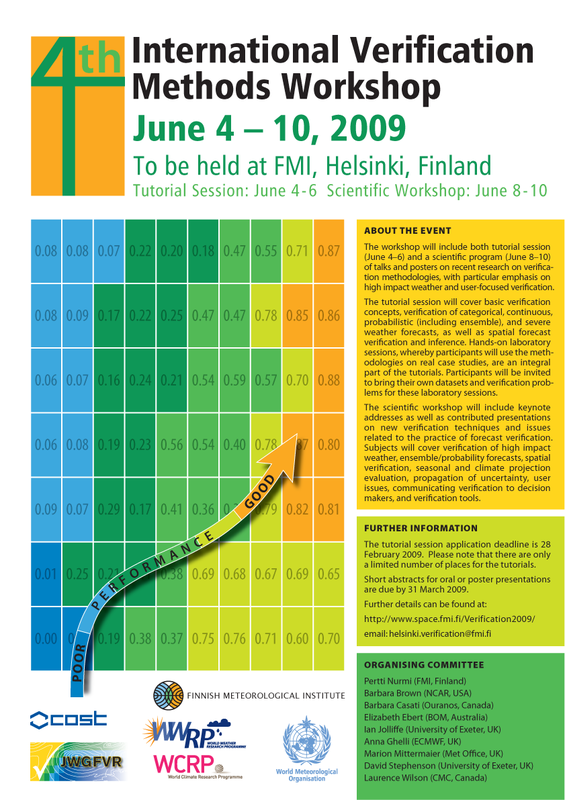 Kalle Eerola: Verification of the Hirlam NWP forecasts and the connection between the scores and improvements in the model. 8.3 Pascal Mailier: Can you really trust long-range weather predictions? Confessions of a rogue forecaster.